A reader of Trace your Dutch roots asked me about the origin of his surname, Hartel. Hartel is an uncommon name, I have never encountered it before. There are only 67 hits in Genlias, without a clear geographic concentration. The best place to find information about a surname is the Family name database of the Meertens Institute. About Hartel they tell it's a name derived from an address or toponym. In other words, the Hartel family originates from a place called Hartel (or something similar). Unfortunately, Meertens does not tell where or what that place was. From the 56 Hartels in the 1947 census, 22 came from Amsterdam and another 17 from the rest of the province Noord-Holland. Similar names like Härtel (4 out of 7) and Hertel (33 out of 58) show a similar concentration in Amsterdam. So my next step was the Amsterdam registers. The old marriage registers - which usually list place of origin of both spouses - are not online yet, but the Amsterdam baptisms are. There is only one Hartel baptism: Johanna Maria Christina Fredrica, daughter of Johan Gerrit Hartel, was baptized in 1783. One of the witnesses was Diedrik Philip Hartel. She was baptized by Wilhelm August Klepperbein, a German minister. This suggests the Hartel family may come from Germany. There are also a few hits for Hertel, most of them seem to have a German connection too. I have no proof yet (for that I have to visit the Amsterdam city archive), but I expect the Dutch Hartel family originates in Germany. Just to be sure I checked the online German phone book and I found 687 hits for Hartel, 3744 for Hertel, and 2857 for Härtel. So my hypothesis is that the Dutch Hartel family actually came from Germany. What Mr. Hartel needs to do now is confirm that he descends from the Amsterdam Hartel family, and then check the pre-1811 Amsterdam marriage books (this can be done in his local FHC) to confirm they came from Germany. 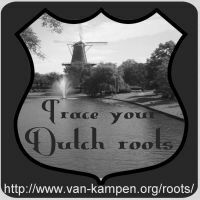 Do you also have a question about Dutch genealogy that you want me to discuss? Leave your question in the comments below this post, or use the contact form. Thanks for your reply. While I was researching for this post I also found the (20th century) emigration record, so I'm sure that this reader has (recent) Dutch roots. hi can anyone help. Trying to find the origin of surnames Grelling and Lanting. Also as a first name Yantje. Yantje is probably Jantje in Dutch. It's a diminutive of Jan, which is the Dutch form of John (so Jantje means little John). Diminutives of male names were often used as female names in Holland. Grelling is a rare name from the southeast of the province Drenthe. I expect there is only a single Grelling family, and you can trace them through the 19th century in Genlias. my mom is a Hartel and her roots are from the Liege or Luik area from 1700 this part of Europe was back and forth part of Netherlands, France and now it is Belgium but just a stone throw away from the Dutch and German border. My mom and her father are from Groningen , Netherlands but her grandfather from the Luik/Liege area. we don;t have anything else.